Last year, I bought a long sleeved tee from Teespring, a web site which advertised heavily on Facebook. Long sleeved tees are valuable because they are so versatile in spring and fall with the ability to push up the sleeves if I get too warm. Plus, under layers, they keep my arms warm and aren't as heavy as a sweater. This is a Discworld image. 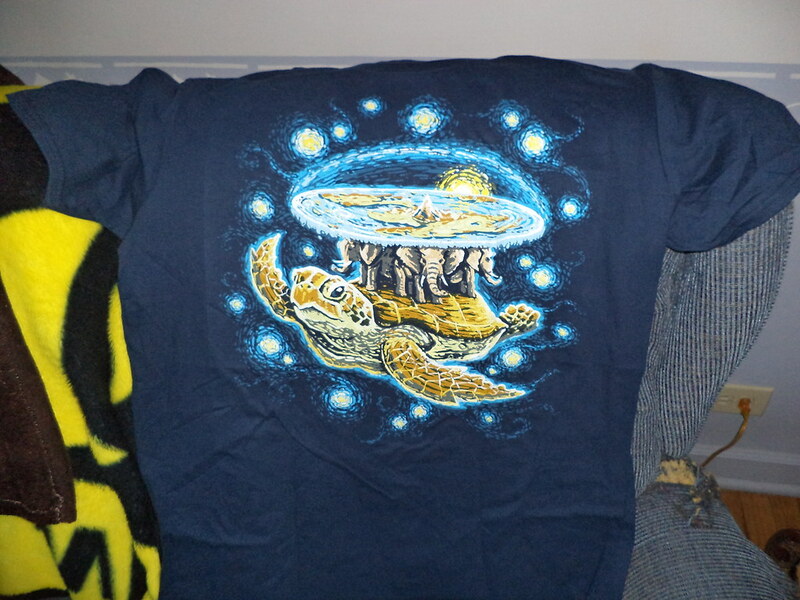 That's the Great A'Tuin, the ultimate turtle on which the four elephants holding up the world stand. 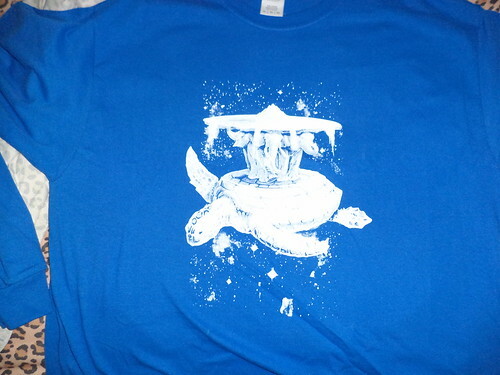 In the cold of space, there's ice on A'Tuin and the elephants. The Discworld spins around the cone in the center, The Hub, and the seas fall off the sides in long cascading tendrils of water and ice. I could get this image on any color tee I wanted. This is my favorite color. But, at the end of February, a rather large controversy arose centered around Teespring. I can't find the actual start of it but accusations were made suggesting Teespring ripped off the artists whose designs were on the clothing they sold. Friends who are artists said this was "well known" within the artistic community. It's a very double-edged sword. You want people to see what you do because the way to make money is to have people buy your stuff. The Internet makes it very easy to reach a world-wide audience you never would have reached before. With that visibility comes those who don't care if you spent 382 hours working on something. They are going to steal your design and slap it on a tee shirt and sell it for $14. I know this is a huge problem in the comic world. Comic conventions have given space to "artists" who print other people's stuff and sell it as their own. Names are tossed about. Videos of confrontations abound and calls for boycotting certain conventions until they weed out the imposters happen every convention season. I've purchased things from Teespring before. Witness this tee shirt, one of my favorites. I have a red shirt with a black cat slogan on it which is not as high quality. I have to admit, I don't know the original artist. Hearing people who have more knowledge than me rail against a web site made me wonder if my purchase ever did anything for the artist. Am I perpetuating a fraud? I adore both shirts. The tee part is comfortable and exceptional quality. I love the designs, obviously, or I wouldn't have purchased them. Since the conversation at the end of February, I have seen zero advertising on my Facebook feed from Teespring. Reviews are not favorable. When you poke around a bit, supposedly Teespring was created as a means for artists to get their work out to the public, but a lot of people are saying this isn't happening. So I feel guilty. In reality, I need more tee shirts like I need bubonic plague, regardless of their design. My conscience now won't let me order anything from this company and will force me to see if I can track down a shirt designer unless I'm getting it from some place like Disney. I guess the cautionary take away is that if I want to support artists, I need to start frequenting arts and crafts shows. That probably wouldn't be such a bad idea. It would get me out of the house.